Every brand out there needs a ‘FACE’ to be easily recognized. By adding an element of personification through a recognizable entity (Mascots or Celebrities), businesses can help their audience easily identify and remember their brand. However when it comes to searching for a new face to represent their brand, businesses often find themselves at crossroads with the choice between Mascots and Celebrities. 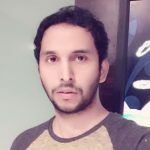 In this article, we’re gonna see which among these is more effective and good for a company’s branding in the long run. Celebrities endorsing products is nothing new. For years, we’ve seen advertisements featuring celebrities in TV, Magazines, Social Media, billboards and pretty much any other place you’d find an ad. But does celebrity endorsement lead to increase in sales and awareness of a company’s products? In the initial stages, yes, and that too only if you choose the right celebrity and get your campaign right. This is pretty obvious! Getting a celebrity to promote your brand can cost you more than just a few bucks. To give you an idea, Beyoncé reportedly charges upwards of $1,000,000 for a single instagram post. No wonder she has a net worth of $355 million. How can you expect a celebrity to represent only your brand? They can only stick to your brand for a certain period of time based on the contract you sign with them. One month they will promote your brand and once your contract ends, their social media feeds will feature another brand and all your branding efforts will be lost, just like that. You can however sign up a lifetime deal with a celebrity and they will only feature your brand forever. Nike recently signed up a lifetime deal with Lebron James and it cost them only a mere Billion dollars. That's right, Billion dollars with a capital ‘B’. Are you thinking about a lifetime deal with any celebrity? No matter how big your brand is and what celebrity you choose to endorse your brand, if you don’t hit the rights note, your campaign might misfire and it could cost you millions of dollars and even customers may fall out of favour for your brand. Even Pepsi’s most recent campaign with Kendall Jenner was an epic fail. When you sign up a celebrity to promote your brand, you also sign up for everything that comes with them. This means if they trend on social media for wrong reasons like personal scandal or other controversies, this may in turn affect your brand credibility. All top brands out there have faced this situation before. If the celebrity is too big and your advertisement focuses so much on the celebrity, the audience will remember only the celebrity and not your product. You don’t want that to happen to your brand, do you? Now that we have taken a closer look at the challenges that come along with celebrity endorsements. It is time to take a closer look at Mascots. Mascots are incredibly powerful marketing tools. They can act as official spokescharacters who can promote your brand on a personal level. They also have the natural ability to connect with people of all age groups. Designing a custom mascot for your brand can cost you only a few hundred bucks. All you have to do is draw a rough version of your mascot on a paper and pass it onto a freelancer to design a graphical version of it. Next up you have to bring your mascot to life by transforming it into a costume. This can only cost you a few thousand dollars. Mascots are not bound by any contracts and they don’t represent any other brands. They will be your exclusive brand ambassadors forever. Mascots can greatly increase your brand’s shareability on social media. Furthermore, a recent study conducted by synthesio proved that mascots generate more social media buzz compared to celebrities. To give you an idea, while celebrity Danica Patrick generated only 12.72% of social mentions for GoDaddy, the Pillsbury Doughboy was able to generate 22.14% of social mentions for Pillsbury. Mascots are not celebrities to be involved in any scandals or controversies. So your audience will always adore them for what they are. Mascots are suitable for a wide variety of marketing purposes. You can place your mascot pretty much everywhere and even profit by selling them as a merchandise. Make use of your mascots effectively in social media. 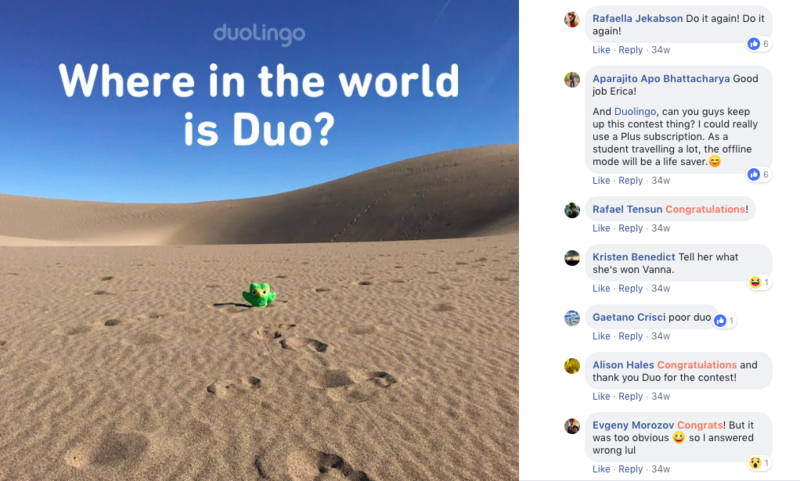 Duolingo does a great job at it, they make sure to include their mascot, Duo in almost all their posts and now it’s pretty much registered in their users minds. 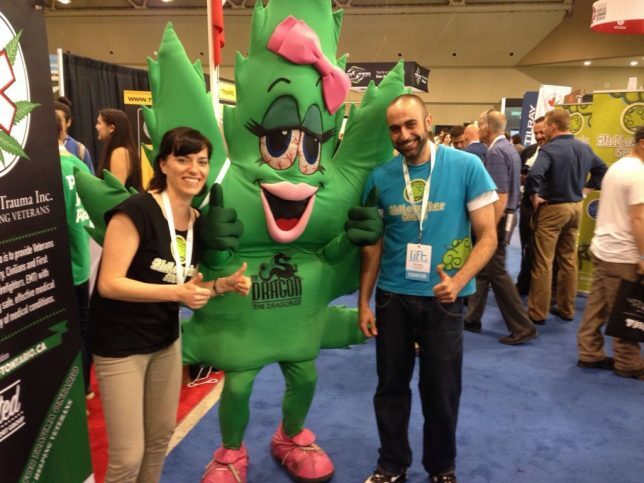 Having your mascot in trade shows is a great way to attract visitors to your booth. Kids and adults alike will wanna take a selfie with them and post them on social media, which is at the end of the day better for your brand. Explainer videos help your visitors understand your product/service within 2 mins. Using your mascot to explain your product/service to your prospective customers will naturally make them fans of your mascot. There are even many more ways you can incorporate mascots in your overall branding strategy. Try to align your mascot with your overall marketing goals and make it an essential part of each step in your conversion funnel. So, I think we have reached a conclusive verdict now that mascots are definitely the way to go forward if you’re looking for someone to represent your brand for ages to come without causing any controversy. We at Animaker know how important mascots are for your business. That’s why we offer a custom character program where we recreate your brand mascots as custom characters so that you can use them in all your marketing videos. Reach out to jerry@animaker.com for more information.